Dog Friendly Pubs in Glasgow, Scotland. The only UK brewery to produce all our beers in accordance with the 1516 German Purity Law. Our brewery on Glasgow Green is also home to a bar and restaurant, serving traditional German food along with Scottish favourites. Excellent music policy, adventurous drinks list and quality food whatever your budget. The Lane is a destination in its own right. Serving delicious home cooking from breakfast ’til supper in a comfortable, inviting bar & kitchen. 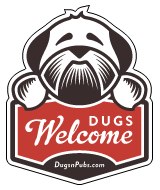 There are a total of 94 dog friendly listings in the Glasgow Pubs category. Please log in, or sign up as a member to view all listings.